Interior view of the language lab in Denbigh Hall. 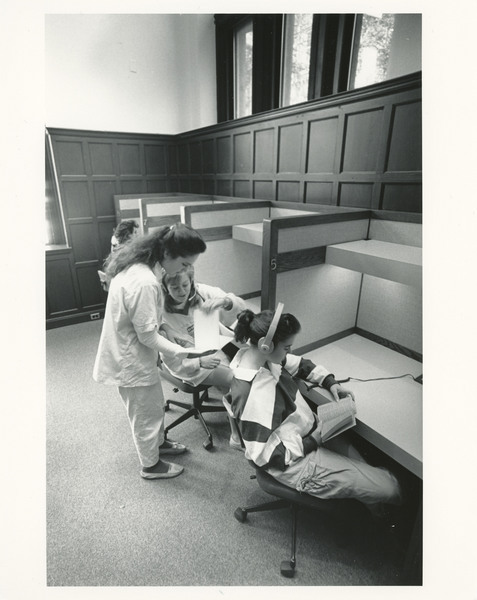 Several students, wearing headphones, sit in booths. One student, nearest to the foreground, sits reading from a book. A female instructor attends to the student sitting behind the reading student. Another student is also visible sitting in the background. The booths are marked by numbers. The image captures Booth 5 through 7. Fuller, “Language Lab, Denbigh Hall,” The Albert M. Greenfield Digital Center for the History of Women's Education, accessed April 24, 2019, http://greenfield.brynmawr.edu/items/show/2687.